Long before there was a Boyle Heights, the area was occupied by the Lopez and Rubio families who had adobe houses there. Perhaps someone descended from those families has photographs and the history of those important early settlers and their homes to share on this blog. Boyle's home was remodeled sometime around 1867 (see the drawing below by Harriet Morton Holmes for the 1935 book The City That Grew by Boyle Workman) to accomodate his daughter and her new husband, saddler William Henry Workman. This wood frame addition in the Gothic Revival style was built to the south side (left side of the drawing) of the brick home and was used by the couple until Andrew Boyle died in 1871, leaving the house and land to his daughter and son-in-law. William and Maria Workman occupied the home for another fifteen or so years, but as their family grew, the Boyle house became too small. To the south, then, about 1885 a Queen Anne-style house was constructed and the Gothic Revival portion of the Boyle house was moved and incorporated into the new home. More about the 1880s home in the next post, but the Boyle house continued to be used by the Workman family over the years. In 1910, William H. Workman, Jr., who was active in real estate and banking, dramatically remodeled the old Boyle house (see below), including the addition of a second floor and exterior renovations that turned the structure into an Italianate villa. 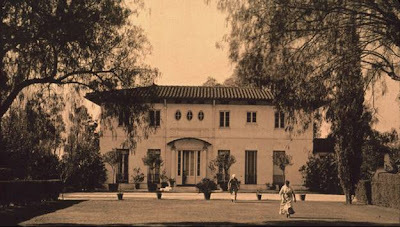 By the 1920s, however, William H. Workman, Sr. had died and his children and widow moved to the west side of Los Angeles. The Boyle house was sold to the Jewish Home for the Aging, which owned this portion of the Boyle/Workman estate until 1974. Five acres, including the Boyle house, were then sold to the Keiro Senior HealthCare organization, which has now served the Japanese-American community on the site for over thirty years. Due, it was reported, to earthquake damage from the 1994 Northridge shaker, the Boyle House, long used as office space, was razed shortly afterward. The care facility, however, bears the same address the house once had: 325 South Boyle Avenue. 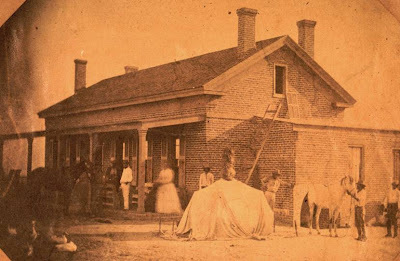 I have at least a half-dozen 19th Century photos of Boyle Heights (along with a few documents) I have acquired for an eventual museum about Los Angeles and if anyone at the Society would like to make copies, I'd be glad to make them available.